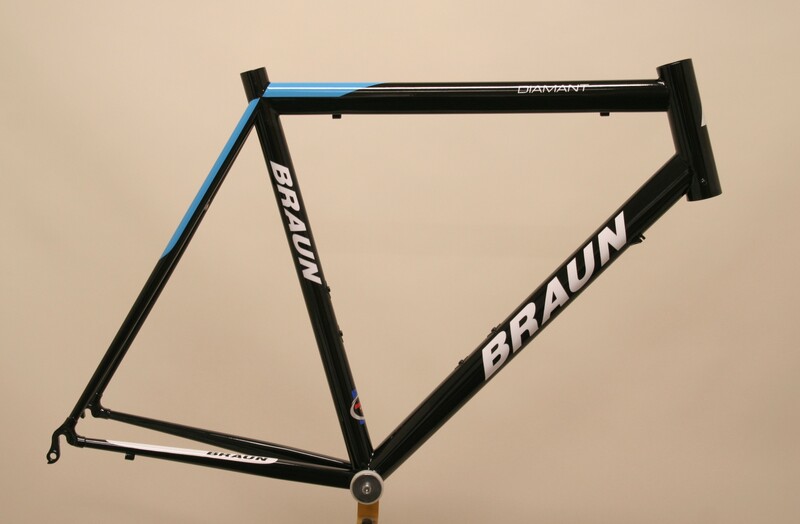 The frame is built with a mega oversized headtube,which is also high-alloy steel with a diameter of 46 mm and a thickness of 1 mm, Together with the oversized double butted profiled 0,6__0,4__0,6 mm. top tube. This ensures that the diamond version is the most stiffest and strongest frame , for all intents and purposes suitable., Full speed to descend or ideal for climbing because every kick on the pedals tangent is. The tubes connect better with each other. The front frame is oversized, particularly the top tube, with a special tube shape with flattened sides, and a pointed oval shape for better aerodynamic properties, Most people do not see (at first sight) that this bike is made of lightweight steel. Because of the full semie-integrated headset, the best control assured. The fork is Dedacciai WAVE BLACK / BLACK FIN full carbon produced, with a steerer tube of 1'1 / 8. This results in a light bike without concessions. The frame meets the requirements of the professional cyclist, but also to the recreational cyclist who loves to much mileage and a bike that lasts. The frame feels safe in the corners, and drive better over cobblestones. This bike is the best downhill, without having to need to kick. This is not only in materials, but also to the geometry. Whether the bicycle is fully assembled with SHIMANO DURA-ACE or ULTEGRA makes no difference. Over this bike holds an exceptional level.